Weekly Public Talks from the academy, industry, and a variety of creative fields that represent the breadth of what Media Studies is and can be. 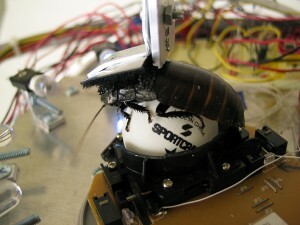 The project is just one example of Hertz’s studio work that illustrates how critical inquiry in the humanities can be applied to the production of electronic art and industrial design. With projects that have been shown in thirteen countries and various international festivals and galleries such as the DEAF, Arts Electronica and SIGGRAPH, Hertz focuses on a side of contemporary art and design that isn’t about aesthetics or efficiency. He challenges our comfort level by pushing our traditional views on perception and technology, and in doing so, sheds light on the power of critical making. 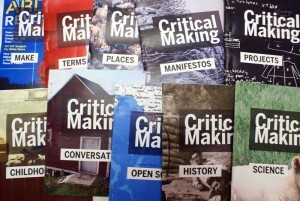 Matt Ratto, Assistant Professor and director of the Critical Making lab at the University of Toronto, originally proposed the term “critical making” as an “evolution” of the concept of critical thinking. 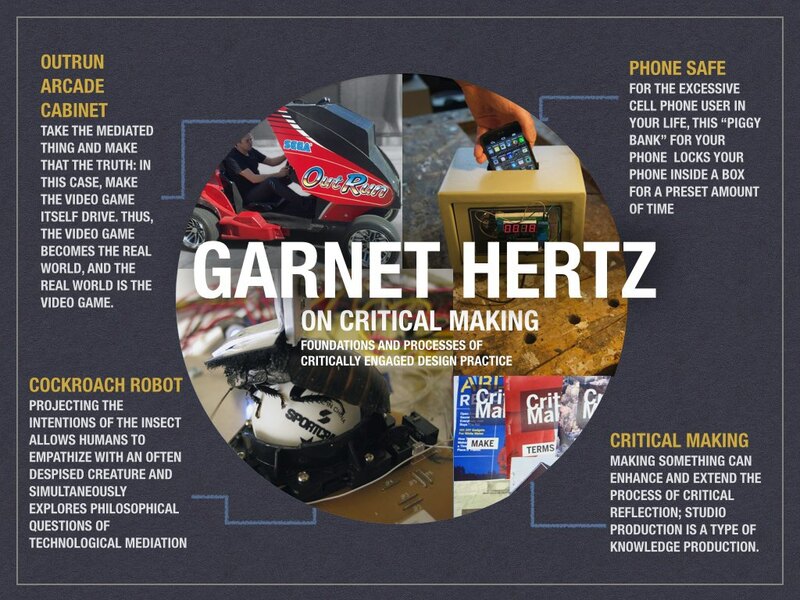 Hertz interprets critical making as a thoughtful exercise in hands-on practice. 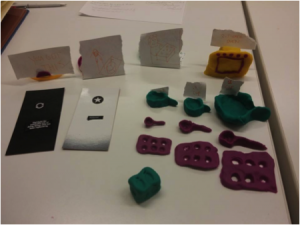 Critical making comes with a dual proposal: one, makers need to be critically engaged with their social, cultural and historical environments; and two, critical making requires hands-on, physical work. The essential idea is that making something has a clear place in enhancing and extending the process of critical reflection; studio production, in other words, is a type of knowledge production. 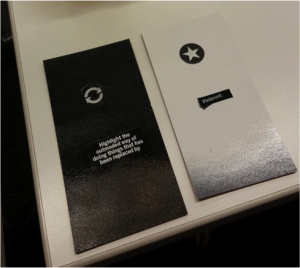 To help the critical making process along, Hertz is developing a set of “critical making playing cards” for practitioners. Using a four-step methodology to critical making, the cards act as a tactile approach to critical thinking by making it a mind game. The point is to prioritize social and cultural values in product engineering over the traditional impulses of profitability, efficiency, and usability. Hertz proposes a four-step methodology to critical making. First, identify the core metaphors of the field; then recognize what the metaphor marginalizes. Then flip the metaphor to center what is excluded, and finally, build alternatives that embody the inversion. In short: “take the forgotten thing and put it at the center.” He recommends using this method at the beginning of any project. When applied to product design, we might begin by focusing on the world of “winning” products: those products that have complied with the provisions of the market to create huge profits, and are determined to be successful. Then, we might start a mind game by thinking of potential “losers”: technologies, designs, or whatever else is kept in the shadow for some reason. The game requires creativity in order to think about possible problems to solve, and why certain things have been forgotten. And just before thinking about a solution, Hertz tells us to stay here — in this “problem definition” area — a little bit more, so we can reflect. It is important to understand why these aspects have been forgotten and the main differences between the “winners” and “losers.” It is important to understand why certain elements have become influential. The final step is then to do. Hertz invites the participant to join the makers’ philosophy, a DIY way of thinking in order to express yourself. Translate your reflection into a project. It can be a drawing, writing, sculpting with clay, photography, etc. The point is for you to become a doer of that thought. Doing, Hertz argues, is a more inclusive practice, because it offers a more tangible way of explaining your conceptualization and the thinking around it. Doing and making offer concrete “things to think with.” Whereas explaining the concept verbally to someone who isn’t an expert in the field could be quite difficult, a tangible object is more easily understood. Through this process Hertz encourages people not to settle for what they have already experienced or have seen. He teaches us to see beyond what we know. Society has reflected in our eyes the “winner products.” However, maybe they are not what we should call “winners” at all since their predominance and prevalence is often simply a product of chance, or a consequence of chains of action driven by commercial or political value systems that don’t reflect our own. Garnet invites us to see the spots between these “winners” and look for the “forgotten things,” which creates space for new opportunities and different ideas. It’s a refreshing and authentic method to “think outside the box” by actually doing it. Hertz’s worldview is a challenge to humanity; through redesign, critical thinking, and ingenuity, he dares us to view something ordinary in an extraordinary manner. Sometimes it seems that we are living in a world of zombies, where machines and technology seem to be winning. Yet, reflection, critique, invention and creativity will never cease to exist because they are the most basic part of human nature.